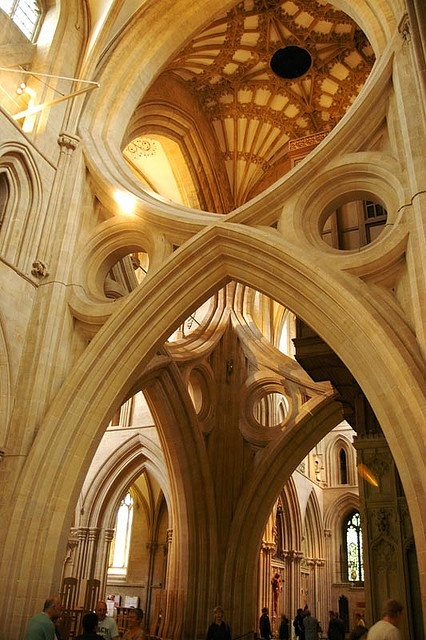 Wells Cathedral is a Church of England cathedral in Wells, Somerset, England. It is the seat of the Bishop of Bath and Wells, currently Peter Price, appointed in 2001. The present dean is John Clarke. The first church on the site was established in 705. The present building, dating between 1175 and 1490, has been described as "the most poetic of the English Cathedrals". It is moderately sized among the medieval cathedrals of England, falling between those of massive proportion like Lincoln Cathedral and York Minster, and the much smaller Oxford and Carlisle. With its broad west front and large central tower it is the dominating feature of its small cathedral city and is a significant landmark in countryside of Somerset.